Inspired by the 60’s Triumph off road sports motorcycles that were stripped down for a purpose, the Scrambler demands attention wherever it goes with its own purposeful look. The legendary air cooled 865cc parallel twin is now fuel injected and with a 270 degree crank delivers a distinctive exhaust note through the stylish high swept chromed side pipes you can’t fail to notice. 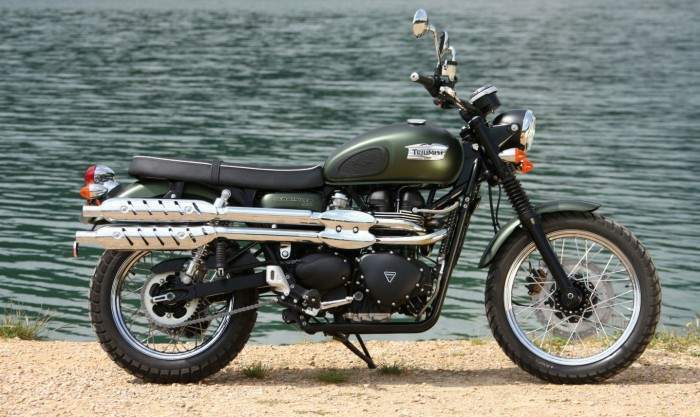 Add classic 60’s styling details including gaiters, white seat piping plus two new colour options of Jet Black and Matt Khaki Green and it won’t take long to realise why the Scramblers of the past were the choice of Hollywood icons of the era and why they’re perfect for today’s urban jungle or great escapes into the countryside. The Scrambler’s air-cooled, parallel twin cylinder engine offers a cubic capacity of 865cc for excellent midrange torque. Both pistons rise and fall together via a 270° crankshaft firing interval so the classic character of a British twin-cylinder engine is retained, whilst twin balancer shafts provide civility and refinement. 90% of peak torque is maintained from around 2500rpm through to redline providing smooth, effortless acceleration throughout the five gears. With a dual-sport, high-pipe style made famous by the likes of Steve McQueen, the TR6-influenced Triumph Scrambler exudes cool. From the white piping around the edge of the wide, flat two-up seat to the dual, upswept chrome pipes with slotted heat guards, it is a real eye-catcher. While having lunch at a sidewalk café with the Scrambler parked across the street, I smiled at how many folks stopped to admire the bike. Like the other retro rides, it looks like a classic even though it’s brand-spanking-new. The Scrambler’s protein comes from an 865cc, air-cooled, eight-valve parallel-twin. Triumph claims 58 horsepower and 50 lb-ft of torque at the crank, and it does the ton without much effort. The engine’s 270-degree firing interval gives it a distinctive exhaust note, more like a V-twin than the 360-degree crank on the Bonneville. Our test bike’s high pipes seem to have lost their baffles prior to delivery, making them much louder with a sharper blat than stock. 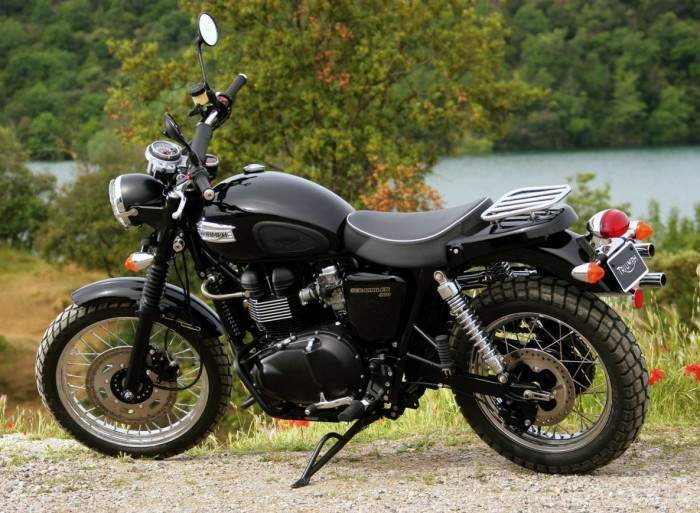 Perhaps that also accounts for the backfiring 2010 Triumph Scrambler often experienced when slowing down. Though I showed restraint on the throttle to avoid upsetting my neighbors, I enjoyed the loud, hot-rod exhaust when strafing back roads. It felt and sounded like the hell-raiser this bike aspires to be. When Triumph revamped the Bonneville for 2009, it cleverly disguised fuel injection inside what appear to be CV carburetors. The Scrambler is similarly equipped, and it precisely feeds the fuel/air mixture to the counterbalanced engine, delivering a smooth, responsive ride. Complementing the engine is a transmission that is a breeze to shift through its five gears. Single discs pinched by Nissin two-piston calipers provide adequate stopping power, far better than the spongy, wooden brakes of yore. Given my stature, I appreciate the leggy stance of the Scrambler, which at 32.5 inches has a 3-inch-taller seat height than the Bonneville. Its Kayaba suspension, with 4.7 inches of travel in the front, 4.2 inches of travel in the rear and adjustable only for preload in the twin rear shocks, could use more damping but provides a generally agreeable ride. The tall, wide handlebar allows a neutral, upright seating position, as well as plenty of leverage when navigating curves. Handling is light but stable, cornering clearance is surprisingly limited. With dirt-fighting fork gaiters and semi-knobby Bridgestone Trail Wing tires, the Scrambler looks ready for the nearest fire road, even more so if you pony up for the accessory bash plate. Yep, guys used to ride and race bikes like this in the desert and woods alike, but for the rough stuff I’ll stick to my Kawasaki KLR650, thanks. But for back roads and knocking around town, the Scrambler is hard to beat in terms of pure fun.